How's your jewelry box looking? If you already have a solid collection of simple gold pieces, as well as timeless silver necklaces, rings, and earrings, then may we suggest adding some something fresh, fun, and new into your accessory drawer through the addition of enamel jewelry? You definitely won't regret it, and if you're not familiar with this style of jewelry, allow us to briefly explain. Think about where you've heard the term enamel used before. Most likely at your dentist in reference to your tooth enamel, a protective layer that prevents against decay on your pearly whites. Well, enamel in the jewelry world is fairly similiar—it's a decorative and protective coating that is painted over metal. Per Calla Gold Jewelry, enamel "is made up of a glass, paste-like substance that is adhered to a metal through fusion at very high temperatures. It starts out in a powder form. The powder form of each color looks like baby powder. You'd never know the vivid colors it creates by looking at the powder." 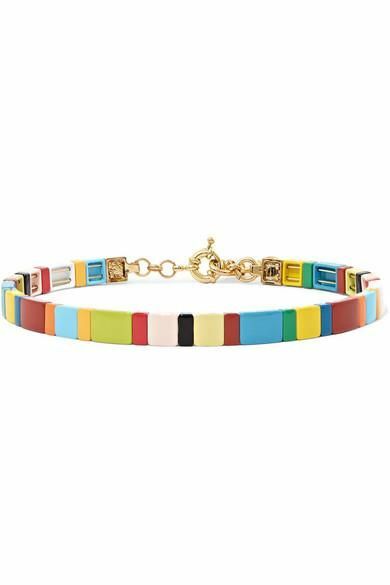 To help you refresh and brighten up your jewelry box, we went on a shopping mission to find the most stunning pieces of enamel rings, necklaces, earrings, and bracelets on the market. Once you see our finds, we're fairly certain you'll become as enchanted as we are with this style of jewelry craft. Now, read on to see and shop our enamel jewelry edit below. How pretty is this choker? A delicate bracelet perfect for a minimalist. The cutest little earring there ever was. The detailing on this ring is amazing. No piercing? No problem. These have a clip-on closure. This one holds a powerful meaning. Keep evil away with this enameled evil eye earring. This earring is painted with light blue enamel. Gift yourself with these stat. Ready to ward off evil? Green and blue are one of our favorite color combos. Another dainty pick we're eyeing. Clearly, we're loving the star-and-moon jewelry trend. We suggest you read the product description on this one. Earrings inspired by the Baroque and Renaissance eras. Jelly hoop earrings? You have our attention. Well, did we tell you, or did we tell you? Enamel jewelry is the prettiest trend you'll try this fall.